“Venom” is based on the villain / anti-hero from the Spider-Man comics. After a spacecraft sent into deep space by billionaire Carlton Drake returns to Earth and crashes, it’s surprising cargo is revealed. Drake’s team has discovered amorphous alien lifeforms dubbed “symbiotes” on a nearby passing comet. But after the crash, one of the four captured symbiotes escapes and bonds with a host. With one now loose in the world, the remaining captured aliens are taken back to Drake’s lab in San Francisco. As Drake begins experimenting with the symbiotes on human guinea pigs, investigative reporter Eddie Brock is tipped off on the illegal activities. An advocate for homeless people in San Francisco, Brock confronts Drake with the accusations….and promptly has his life destroyed by the billionaire. He loses his job, his reputation, and his fiancé Anne Weying. Eddie hits rock bottom. But when Dr. Dora Skirth approaches Brock with new evidence of Drake’s activities, Eddie decides to sneak into the lab where the symbiotes are held. There he’s infected by one of the alien creatures named Venom. Together the two must learn to work together and escape Drake’s forces. But they quickly realize the stakes are much higher when the first escaped symbiote arrives on the scene. “Venom” is rated PG-13 for intense sequences of sci-fi violence and action, and for language. As a lifelong reader of the Spider-Man comic books, I’ve followed the character’s long, torturous journey from the comics to the big screen. His first appearance in “Spider-Man 3” was a bit of a mixed bag. But the idea of putting the character in a standalone film, and without Spider-Man, seemed questionable. Then Tom Hardy was cast and I was given hope. And then “Spider-Man: Homecoming” gave me additional hope that Sony knew what it was doing with the Spidey universe. But then they scheduled the “Venom” press screening one day before the theatrical release, typically a sign the film is awful and the studio is doing damage control. So I went into “Venom” expecting a train wreck and was pleasantly surprised when it wasn’t. That’s not to say it was entirely good, but it wasn’t entirely bad either. You have to give credit to Tom Hardy – he’s all-in when playing Eddie Brock. Hardy sells the ridiculous concept well. He plays the hard-hitting reporter early in the film, but when he’s infected by the symbiote, he takes on a manic persona. It’s reminiscent of Dr. Jekyll and Mr. Hyde. 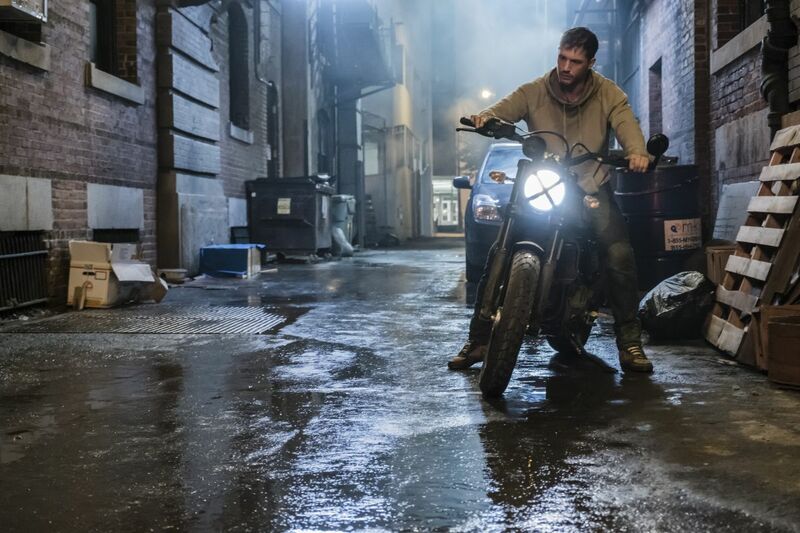 Venom takes Eddie for a joyride and there’s little he can do about it other than grit his teeth and close his eyes as mayhem unfolds around him. I think there are few actors that could sell this character like Tom Hardy. “Venom” also gives a surprising amount of character to the symbiote alien itself. We’ve often see it as a voiceless blob taking over Eddie. But in this film it has a distinct voice and attitude. Surprisingly, Venom provides a lot of the humor as it adds violent commentary to what’s happening on the screen. Venom wants to kill, maim, destroy, and eat a lot (like your typical male teenager), and Eddie has to constantly rein him back in. That conflict between the two brings some much-needed comic relief to the story. 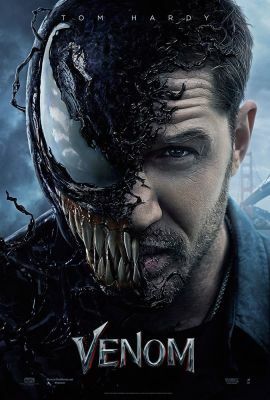 While the first quarter of the film is really dull as it establishes Eddie’s character, things don’t get interesting until Venom infects him. That’s when the spectacle you want to see kicks into gear. The action scenes and visual effects are decent. We see many of the tricks used by Venom in the comics – shooting tentacles, biting off heads, etc. We also see spikes shot, blades formed, and other fun stuff. Action fans and comic fans should be satisfied. There are two bonus scenes – one mid-credits and another at the end of the film. I won’t spoil the mid-credits scene featuring a surprise character, but the last scene is a sneak peek at “Spider-Man: Into the Spider-Verse”. While “Venom” was entertaining enough, this sneak peek had more action, humor, and artistry packed into it than all of the live action film that preceded it. It definitely got me excited to see more of the animated film coming in December. I’ve heard “Venom” described as a throwback to the superhero films of the early 2000’s, and that’s a fair assessment. While it is faithful to the source material, it is a bit cheesier and effects driven than the superhero movies we’re used to seeing now. And when you hold it up alongside “Spider-Man: Homecoming”, it looks very weak in dialogue, action, and characterization in comparison. Simply put, it could have been a lot better. The centerpiece of the film is the relationship between Eddie Brock and Venom. While that is successful in many ways, it’s weaker in others. The story hinges on Venom actually coming to like Eddie and even becoming fond of Earth and the human race. While there are small attempts here and there to make it believable, it’s largely not believable based on what we see in the final film. I think more time should have been spent on the symbiote getting to know his newfound host and home. While Tom Hardy carries the film, the rest of the cast is pretty much wasted. Michelle Williams, Riz Ahmed, and Jenny Slate have had phenomenal performances in other roles in other films, but none of that talent is showcased here. Ahmed is a generic “Steve Jobs” bad guy. Slate is given little to do beyond delivering dry exposition. Williams gets a little more to do as Eddie’s fiancé Anne, but it’s not quite enough to make her standout compared to heroines in other superhero films. The end result is a cast of supporting characters that do little more than play straight men and women for Venom’s antics. While I won’t spoil the mid-credits scene, I will say that the character in the surprise cameo wears one of the all-time worst wigs in Hollywood. If that character appears in a Venom sequel, I hope they get rid of the wig altogether. “Venom” is really only for people that have actually picked up and read a Venom comic book or younger fans. Fortunately for Sony, that’s millions of potential ticket buyers. If older superhero films are not your cup of tea, then you’ll want to avoid this.